There's a lot to learn and do here, and the lack of tutorial means you're bound to do a bit of floundering in the early stages of the game. Outside of this, though, the game's difficulty level is actually fairly smooth. This game's battles are the sort that require you to use all your skills, techniques, and abilities in each fight, and things like status effects are extremely valuable. However, the game also heals you fully after every battle, and combat is rarely mandatory. 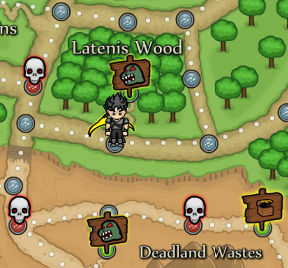 Certain areas in the world map will force you in with enemies, but for the most part, you can choose when and where you fight, which keeps the long battles from growing too tiresome. And if the required fights slow you down too much, you can adjust the difficulty level at any time. Lethal RPG: War Begins definitely encourages you to take things at your own pace, and while you can experience a portion of the main story, the game provides a number of sidequests and optional boss fights that you can do at any time. These offer up goodies like new spellbooks you can use for in-battle effects, new pets for your main character, or items you can use to craft special weapons and armor. So even though the main game is relatively short, War Begins still gives you a lot to do and a lot of customization options. There are places where you can feel its incompleteness, such as in the fact that you'll find a number of crafting materials you can't make use of in the free build. And it is a real disappointment that there's no way to carry anything you find or do in the free version into the full PC version. But even without dipping your toes into the paid experience, Lethal RPG: War Begins still has enough challenging tactics to really scratch that turn-based itch. I've been playing for a few hours and so far there hasn't been much variation in the battles. The 'attack all' skills for two characters are unlocked early, and they usually give the best total damage output. I've just been spamming those on nearly every battle. It does seem there are a lot you can do in a battle, but this game seems to make the same mistake as many RPGs: The normal way to win a battle is easiest and quickest, so the battles are homogeneous and most skills are never used. The sidequests are also pretty routine, and the plot points don't feel unique or engaging enough to be worth the time spent grinding from one to the next. Maybe the game gets better; based on the review there's a good chance it does. There's certainly still a lot to unlock. However, I've spent a few hours and ventured through the first three areas without feeling engaged, so I'm quitting early. Sometimes the dialogue skips while still staying up and it is hard to read it when it when the next dialogue covers it. Sometimes they don't walk on the trail and you think you end up on a monster, but really it is just moving the character along the path above or below or beside where it really is; luckily that is all that happens. Not to be confused with taking a path correctly, but going through an enemy because the path was shorter to the destination. Like bluemoose19 said, it isn't really intriguing enough to continue. Something about Epic Battle Fantasy kept you playing.